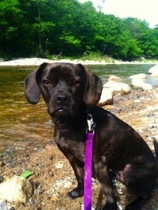 Sophie, a Beagle/French Bulldog mix from Newburyport, MA attends our on and off-leash obedience dog training classes. Her owner’s goals are understandable; she wants to have a better relationship with her dog and for Sophie to be calm when guests come over. 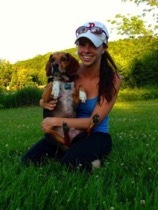 Sophie’s owner wants to nip any behavioral issues in the bud—not a bad idea! Meet Bradley, a 2 year old Beagle hailing from Wakefield, MA. Bradley’s always ready to play! Before training, he could get a little overexcited when guests came. His owner sought our dog training classes to make Bradley more accepting of people and less nervous about fast movements and noises. 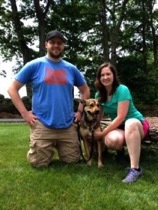 Sable is a 3 year old German Shepherd mix from Chelmsford, MA who found First Choice Canine’s dog training classes with the help of her owners. They love their energetic companion and wanted her to show strangers the same sweet and mellow disposition that she shows at home. Bentley is a 7 year old West Highland Terrier from Tewksbury, MA. Rescued from a shelter, this dog faced a former life of abuse and neglect. Still playful and happy (go dogs! ), Bentley’s owners brought him to our dog training classes because they wanted to have clear communication with their dog and be able to keep him reeled in when he gets worked up.